Pink Sugar Bowl: Tropical Traditions - FREE SHIPPING TODAY! Tropical Traditions - FREE SHIPPING TODAY! If you are a fan of Pink Sugar Bowl, you already know how much I love Tropical Traditions products! I haven't seen a free shipping coupon in a few weeks and they released one today! This code is good for new and returning customers. However if you are a new customer, you can use my referral link (will list it at the end of this post) and not only get free shipping but their cookbook for free as well! 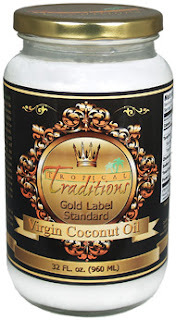 The Gold Label Virgin Coconut Oil was the first purchase I made and I haven't bought any other brand since! Once you try it you cannot deny the quality and taste! I use many of their products and some of my favorites are the Gold Label Virgin, Refined (great in place of veg shortening, or if you don't care for the taste of coconut), Coconut Flour and Dried Coconut! NOTE: To take advantage of this special, you MUST enter coupon code 97212 in your cart before checking out, and choose either Ground or SmartPost from the drop down list of shipping options! FREE shipping is NOT applied automatically. Orders placed before today cannot be refunded for shipping charges. If this is your first order please come back and leave a comment letting me know what you think! The ordering process was super simple, especially with your instructions:) Thanks Deana! I'll let you know what I think of the coconut oil once I've used it. Thank you for ordering Heather! I hope you enjoy the coconut oil! It's my favorite!